Another great day out with my new mountain bike and Martina with her camera. 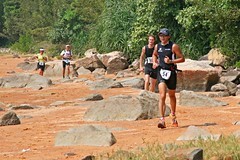 It was the INATT Off Road Triathlon, a Xterra style race consist of 800m swim, 15km mountain bike and 5.5km trail running on the beautiful Wan Chai peninsula in Sai Kung. Who are my gang of brothers this time? There is my arch rival in adventure race Larry and Kin, also Micah from Sonic and Andrew, podium finisher in Singapore Ironmah 70.3. Keith the organiser can't help adding some adventure race elements into it, like after the swim we have to run across a beach, cimbing up some boulders, jumped fences and dash across the camp site to get to the transition. The mountain bike was tough for me, I am still very cautious and slow on the bike, not quite getting use to balancing and picking lines off the downhill. But it was a glorious route, at one part, we had the ocean all to ourselves. To finish off the run, we have to repeat the beach + boulder run again but in much shattered condition, thanks to the marshall who yelled at me and said the guy behind you was trying to catch up, that really sparked off my final charge to the finishing line. I finished in 2hr35min, 15-20 mins behind Larry and Kin, but they are so much faster than me on the bikes, it is kind of expected. Slowly, I am building up my fitness again for Action Asia. All photos taken by Martina, my fiancee. The end of this month will be the one year anniversary of the mountain bike accident that fractured a bone in my arm. I have been staying away from MTB all these time, partly cause of focusing on triathlon but deep down I must admit I was scared. But the enjoyment of Adventure Race is so great, I couldn't hesitate from planning ahead for the Action Asia Challenge Hong Kong in December. First, I check on my race partner, Andy, he is still not training as ever, so any loss of trail running and moutain bike sharpness from my side probably wouldn't matter. Then finally I slashed out on a new machine - the Specialized Epic, finally gone was my oversize hardtail bike and instead of a full suspension cross country bike. Then along with some Sonic guys, I joined a one day MTB skill course in Lamma Island, the instructor has built an obstacle course on a little hill, so we can practise bumps, stairs, tight corner etc in a safe environment. It was a real cool day to regain my confidence back. After lunch he took us to tackle some stairs, it was my my ultimate demon, coz I fractured my arm after falling "over the handle" bar on top of 3 steps of stairs. When it comes to my turn, I stare down the stairs, everything else in the background just fade into a blur. It was that dramatic, like soloing up a rock climb and nothing else in the world but the route itself matters. I headed down, there is hardly any difficulty with the wide stairs but my heart rate just pump right off the scale. I did only half the staircase and the flash back of the crash replayed again and again. Thankfully I had the gust to do the eventual challenge of the day, a drop off from a big stone, probably a bit over half a meter tall. It was easy when we know the right technique. The next sunday, I head out to do a easy ride with Brian and gang in Tai Tong Country Park, the very park where the accident happens but we stayed on easy trail all day. It was part of the scheme to exercise the demon within. 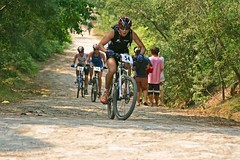 So much practise for now, I am gonna do a Xterra style off road triathlon coming Saturday. Should be fun. And let's hope for a safe off road racing season! It wasn't my prettiest race but I did it anyway. 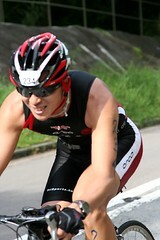 It was the Hong Kong ITU Triathlon yesterday. I turned up barely recovered from a bad cold and felt really not in form. But I wasn't limping or coughing blood, so not doing it due to a feeling of my "form" is simply an excuse. 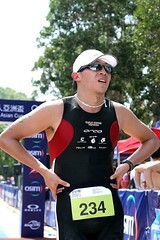 Beside it is my first year in Triathlon, how can I miss THE triathlon race in town. 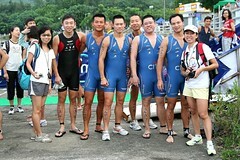 The swim began with a deep water start in Tai Mei Tuk. It was hard as hell after having swam only 3 times since Singapore a month ago. Though I got out of the water along with a few Sonic teamates who were roughly similar speed as me in training, so maybe I wasn't doing too bad afterall. Once on the bike, I felt more alive, I had rode the Bride's Pool Road only once before when I first got my bike. And this time I was tackling the hill climbs with much stronger legs. The 10km loop has two hills on either end, with an incredibly taxing 4.5% gradien hill at the far end. But then once you turn around, it is a free ride downhill reaching 45km/h. 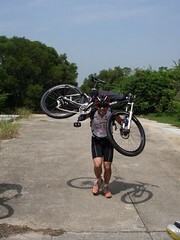 I pushed quite hard on the uphills, unlike Sinagpore, I didn't try to hold myself back. I felt I might get some presentable result today. Came the run leg, two loops across the exposed reservoir dam, I felt quite fresh in the begining, and I saw many sonic teamates just ahead of me, doing their first loop, so if I pushed hard I would get some good timing this time. Too eager to do that, I stupidly did a wrong U-turn at mid way of the dam that was only meant for the "fun-distance" category. The helpers standing around there actually watched me doing the mistakes and said nothing, one of them even recorded my race number on the timing sheet. I didn't realise my mistake until I was well into my second loop, it was so frustrating to have screwed up on my strongest part in such a dumb fashion after all the hard work on the swim and the bike. So in the end, between "2km short" or "3km over", I decided to ran two full loops from that point and actually tallied 13km of running in the blistering sun. 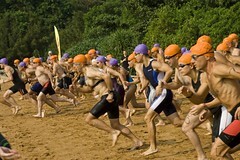 In my final length of the dam there were hardly anyone left on the course . I was out of glycogen, cramps were urging to kick in and eventually when I made it back toward the finishing line, the transition area was already being cleared up. Thankfully Martina and Madoka was there for the finishing snap. So it was incredibly frustrating, I approached the race saying it was not an important one for me, but once I got on the race course, it was diffcult to take it easy, and so although I can easily look on the bright side and say at least I completed it, deep down I will always be looking forward to a revenge in the next 12 months.